Augusta, GA – Hershel Lee Harrell, 81, husband of Connie Harrell, entered into rest Sunday, February 10, 2019, at Augusta University Medical Center. Memorial services will be held Thursday, February 14, 2019, at 6:00 PM from the chapel of Chance & Hydrick Funeral Directors. 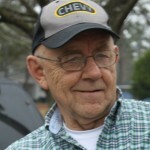 Mr. Harrell, son of the late Lillian Robbins Harrell and Harvey Harrell was born in Douglas, GA, and retired as the manager of Baker Distributing. He was preceded in death by his brother, Jerry Harrell. In addition to his wife he is survived by his son, Kevin Scott Harrell (Brittney), of Augusta; his daughters, Kendra Harrell and Whitney Harrell (Levi McMurtry), both of Augusta; his stepson, Russ Finstad, of Augusta; his grandchildren, Evan, Kayden, Kaylee, and Emma; his sisters, Virginia Blocker, Mary Nell Clark, and Linda Brantley. The family will receive friends, Thursday, February 14, 2019, from 5:00 PM until the hour of service at the funeral home.